here are a few pics of my devices. Oh and that bottle of Beast Ice, is actually what I store my daily vape juice in. Very nice setup! I use longer and slimmer batteries, but my clearo tanks can hold up to 2,4 ml of juice and I think they are a bit bigger then yours, not sure though. ChrisA Wrote: Very nice setup! I use longer and slimmer batteries, but my clearo tanks can hold up to 2,4 ml of juice and I think they are a bit bigger then yours, not sure though. 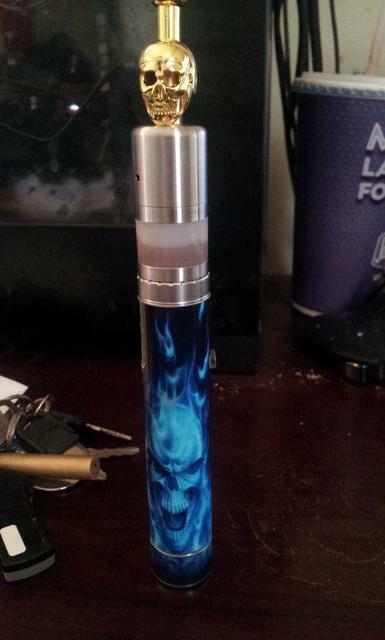 thanks man My favorite so far is the provari (with the blue skull wrap) and the rebuildable tank. I think I am done buying mods for the time being but I may pick up a spare rebuildable tank and a new dripping atomizer for testing different juices. The blue skull wrapped one looks really cool. I need to get myself one of those. I still use stock batteries which look really boring. Do those batteries come with the skull logo by default or have you custom ordered that one? ChrisA Wrote: The blue skull wrapped one looks really cool. I need to get myself one of those. I still use stock batteries which look really boring. Do those batteries come with the skull logo by default or have you custom ordered that one? That is actually a really expensive mod, its called the Provari from provape.com. I bought the mod, a couple provari approved batteries, and a charger for about 200 bucks. It was steep but well worth the price so far. The skull is a vinyl wrap that you can buy on their site, they are cut specifically for the provari and they run about 13 bucks. You might want to look into something like the vamo 2 or 3, they are like 40 bucks and look nice too. 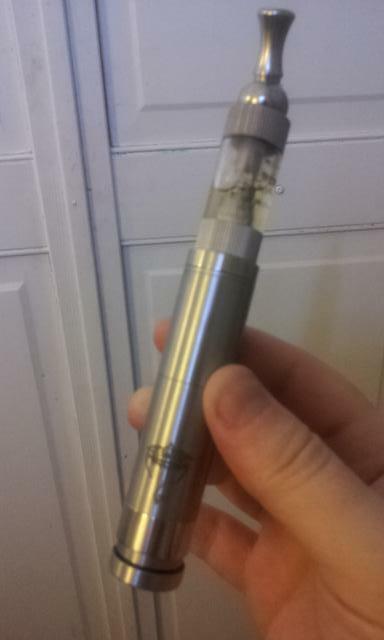 Oh and for the batteries, they are separate and slide in through the end cap of the mod. I buy the 18640 size for a longer use time and better vape. Well, investing into vaping for me seems to be a very good idea. Since e-cigs replaced real cigs for me, I would go even so far as to buy 200 $ high quality parts for an awesome vaping experience. You can`t get quality without shelling out a few bucks, right? 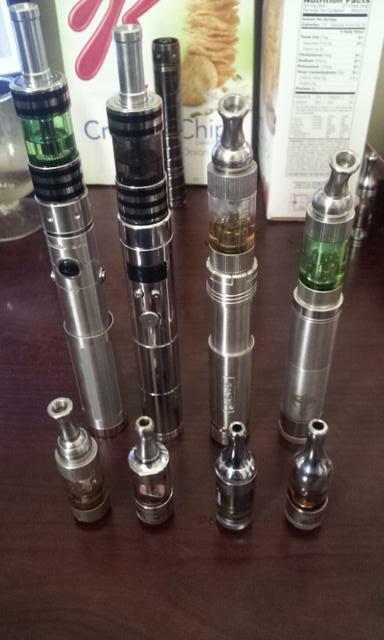 ChrisA Wrote: Well, investing into vaping for me seems to be a very good idea. Since e-cigs replaced real cigs for me, I would go even so far as to buy 200 $ high quality parts for an awesome vaping experience. You can`t get quality without shelling out a few bucks, right? That is definitely true but i do have to mention that today I just built my first sub ohm coil (it came out at .8 ohms) and my provari could only vape it at the lowest possible setting. Any higher and the protection kicked in and it shut off. The sad thing about this is that once i popped my tank with the sub ohm coil on my 20 dollar nemesis clone mechanical mod, it vaped insanely well because there are no electronic parts to limit how much power the batter pushing to the coil. I kinda felt bad vaping on a 20 dollar mod when my provari was sitting there doing nothing lol. Solution? Buy a cheap rebuildable tank to build sub ohm coils on and slap it on my 20 dollar mod and keep vaping higher ohm micro coils on my provari so i can really push it and enjoy all it has to offer. 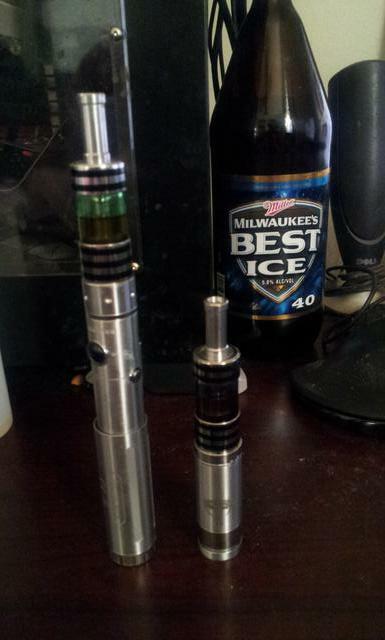 two tanks, no switching, different vaping experiences on the fly! That skull piece you have is pretty awesome. It makes me excited to get into mods so I can have a unique piece versus my crappy little pen. alexiskilgannon Wrote: That skull piece you have is pretty awesome. It makes me excited to get into mods so I can have a unique piece versus my crappy little pen. thanks. I actually just sold that skull one for $150usd on ebay because now im using mechanical mods and sub ohm coils but it was a very nice device for sure.